New Cross and New Cross Gate are in an area originally known as Hatcham and now known for the creative and student ambiance created by the presence of Goldsmiths College, University of London. It is a bustling south London area with the main road heading to the south coast at Dover. There are magnificent views from Telegraph Hill and a range of accommodation including handsome Victorian villas and terraces. 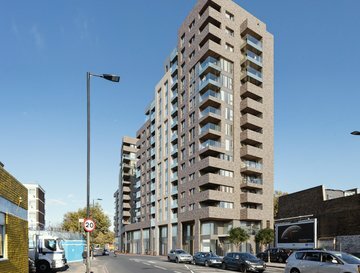 A large development above and adjoining New Cross Station of the Sainsburys Store in being undertaken by Mount Anvil in an innovative style incorporating a new store into the residential development. Hatcham is recorded in the Domesday Book of 1086 and remained a rural wooded area for centuries. In the 17th century, the area was bought by the London livery company, Haberdashers, as an investment. There were market gardens supplying London and pubs like the Golden Cross from which New Cross is said to have been named. The diarist John Evelyn records visiting 'New Crosse' in 1675. New Cross Gate derives from a toll gate from 1718. New Cross was a 'tangle' of roads and railway lines in the 19th century with the railway coming in 1839. 1843 saw the opening of the Royal Naval School which ultimately has become Goldsmiths. Slightly later, in 1885, Millwall Football Club was established. Two tragedies have marked the area - a V2 bomb which killed over 100 people in 1944 and the New Cross Fire in 1981 in which thirteen young people died. New Cross Gate station is on the London Overground branches south to West Croydon and Crystal Palace and north to Highbury & Islington. There are also trains to London Bridge and London Victoria.